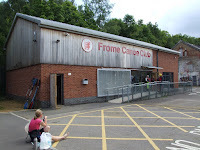 Frome Canoe Club is based at Market Yard in the centre of Frome next to the Cheese & Grain and meets weekly for training sessions on Wednesday evenings between 7pm and 9pm during the spring and summer months. It has a modern clubhouse, opened in 2007. Click here to see inside. 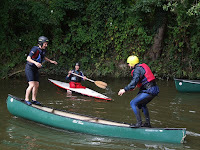 Frome Canoe Club has a good programme of events and white water kayaking is one of the popular activities that members enjoy. Frome Canoe Club has a strong slalom focus and competes in many events during the year. It also hosts two national events. For more details on slalom click here. During the year Frome Canoe Club runs courses to help paddlers improve their skills. Young people can enroll on the Paddle Power Programme. Adults can take One, Two and Three Star awards.